The more you know, and the more you can prove you know, the better ROI you can provide to your employer or prospective employer, the more you can improve your company’s bottom line, and the better you can position yourself in your chosen discipline. HSMAI introduced certification for hotel sales professionals nearly thirty years ago. 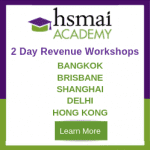 Today HSMAI offers training and certification in several disciplines, including sales, revenue management, business acumen, and the newest, digital marketing. Select the Certification you’re interested in to learn more including the qualifications and procedures to apply, and to download applications. For groups of 10 or more, bulk discounts are available. Contact Kathy Tindell for details.